In a world where climate change is said to threaten the lives of future generations, the car industry is widely seen as the main villain. This general view prevails, despite its repeated insistence that it is here to help. Many senior figures go out of their way to show they are taking environmental issues seriously. "Climate change is the biggest single challenge facing the automotive industry today," says Lewis Booth, head of Ford's luxury division, the Premier Automotive Group. 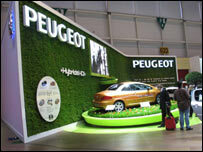 So at this year's motor show in Geneva, which opens its doors to the public on Thursday, there is an environmentally friendly solution on pretty much every stand. The vehicles on offer range from the hybrid diesel and electric cars from Peugeot and Citroen, via Volkswagen's natural gas solutions and Ford's bioethanol, to BMW talking about turbo steam as a future power source and Mercedes backing clean diesel. But none of the above can match Nissan's offer of assistance. The Japanese car maker is showing off a futuristic off-road vehicle that should enable explorers and scientists to journey ever deeper into some of the world's most hostile climes in their quest for a better understanding of how climate change affects the globe. With its virtually bullet-proof 19-inch tyres, and specially modified cabin, the rugged-looking Terranaut concept is apparently no ordinary sports utility vehicle (SUV). This car only has three seats, to make room for bundles of hi-tech lab kits. Problem is, none of this could possibly be cheap, and as such it would probably be well beyond the reach of the average resource strapped academic. The Terranaut may not do much to boost their environmentally friendly credentials. 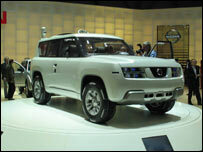 Is Nissan's Terranaut a scientist's dream? 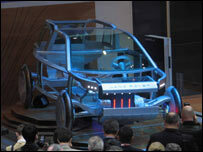 But Land Rover's even weirder looking Land-e concept just might. The offroader may not look much, and despite the car's appearance, what it does is transparent. Land Rover says its so-called "e-Terrain technology" - which includes an "Intelligent Management of Electrical Systems" as well as an "Intelligent Thermal Programme" - offers "practical real-world solutions that will progressively be introduced to our range in the next few years".